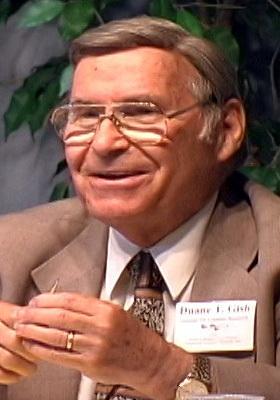 Duane Gish, Ph.D. earned a B.S. degree in chemistry from UCLA and a Ph.D. in biochemistry from UC-Berkeley. He spent 18 years in biochemical research, including three years at Cornell University Medical College, four years at the Virus Laboratory, UC-Berkeley, and eleven years with the Upjohn Company. Since 1971 he has served with the Institute for Creation Research, Santee California, and is presently the Senior Vice President. He is a member of the American Chemical Society and a Fellow of the American Institute of Chemists. At present he has five books in print including Evolution: The Fossils STILL Say No!, Creation Scientists Answer Their Critics, and Teaching Creation Science in Public Schools.